Question Proposed on LinkedIn: Personal development is professional development…isn’t it? When an employee seeks out a learning opportunity to better himself/herself, I imagine that would have a positive impact on his/her work, and subsequently have a positive impact on the company. Do you restrict development opportunities to only that which is glaringly, obviously “professional” or do you allow for more esoteric learning opportunities when determining whether or not to reimburse/support the employee’s development goals? – I guess the answer depends on if you’re asking an L+D person, or a Finance person and also on the companies financial position at the time of asking! As as L+D practitioner I always look at the short/long term relevance to the employees actual role, but also take into account succession planning results, retention figures, other skill areas the employee has etc. It’s the result of all these factors that then has to be justified against he cost of the development opportunity. Personally, I dislike the term ROI – especially when applied to development opportunities – but until the financial decision makers share an L+D practitioners view on development activities we will need to justify things in those terms. To go back to your original question, no, personally I don’t restrict opportunities to those that have a glaringly obvious impact on the company. A major factor I consider is the happiness of the employee and their drive to work hard for the company – and this will be heavily influenced by the development opportunities available to them. For example, attending an event such as the Australian Human Resources Institute HR Practices Day may not seem to have a glaringly obvious impact on on employees day to day work – but the fact that an employee is able to go can have a tremendous effect on their attitude towards the company (and therefore on their performance) and there is also the possibility that they may learn something / meet someone who will have a positive benefit directly for the company. – First of all it’s a question about “business discipline”: I always check for coherence with business needs or its middle/ long term planning. Then, could be some exception is accepted: the very general criteria are in these cases the retention purpose, the people interesting potential, or an intriguing employee’s proposal about a not standard development path (“worth the experimentation”). That at least my opinion & practice. – Most organizations do not understand that there is a big difference between professional development and personal development. Professional development will help develop the skills necessary for you to carry out your job functions effectively but they will not contribute much to all the intangible skills that you need to compete in the modern work force. You are what you think. Whatever you are doing, whatever you feel, whatever you want—all are determined by the quality of your thinking. If your thinking is unrealistic, your thinking will lead to many disappointments. If your thinking is overly pessimistic, it will deny you due recognition of the many things in which you should properly rejoice. – I agree. I’ve seen this work the other away too. I work for an online training company, we offer career development training, but I’ve had members tell me that watching bestselling author Susan Scott teach about “Fierce Conversations” did just help their communication with the team, it helped their marriage. I think any kind of learning opens the door to innovation which is especially valuable to a company. Amy Edmonson is a Harvard Business professor who taught our members “Fail to Succeed” and she stressed that innovation happens when someone has the knowledge to identify patterns or systems that work in one industry or area, and can see how they could apply to a completely unrelated industry or business. 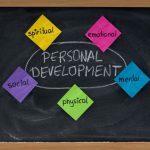 – Personal Development and whatever that includes go hand by hand with career development… From a more psychological point of you good people are more likely to become good professionals than others. – I work for a company that has you set personal goals as well as professional goals. For our personal goal of the year they will reimburse you a certain dollar amount that it may cost you and will have a celebration at the end of the year. And for professional goals, we have every quarter, and get recognized and rewarded if your goals are met (a long with 1:1 coaching to get you there). I feel its important to promote both. I shows you are dedicated to your employees and in turn will have them feel more appreciate and perform better. – When an employee seeks out a learning opportunity to better himself/herself, I imagine that would have a positive impact on his/her work, and subsequently have a positive impact on the company. Do you restrict development opportunities to only that which is glaringly, obviously “professional” or do you allow for more esoteric learning opportunities when determining whether or not to reimburse/support the employee’s development goals? – If the company can recognise an organisational benefit from a personal interest then the activity could be classed as professional development. Strictly speaking if the end result is not a professioanlly recognised award or organisational outcome then really it shouldn’t be regarded as professional development. E.g a friend of mine wanted to train as a sports coach (a persoanal interest), his company not only paid for the qualification but allowed in-work time to do his activity plans. The recognised company benefit was his job role could be expanded from just technical sales to include training and product coaching. For them a win-win. In this example the two can be combined but not as a general rule in my view. To be regarded as professional the outcome has to be weighted towards benefitting a professional situation. – As a small nonprofit, we have limited resources. We allow time for personal development, such as community leadership training for those individuals who are clearly working toward management positions. This training requires 8 sessions which take place on Fridays and Saturdays. We paid the fee and provided work pay for the Friday sessions. The employees attended the Saturday sessions on their own time. We allowed someone who handled housing for our visitors to complete her real estate license, attending classes on company time but at her own expense. These examples are fairly typical, often with shared responsibility in terms of cost and company time when the training or development is not directly related to the job. I wish we had a larger training budget and could do more. – In many organisations justifying a spend on professional development can be challenging especially when the finance team are involved. So I am sure that many organisations would really struggle with the idea of funding personal development that they cannot align with organisational bottom line improvements. However, I am a firm believer in thinking outside the box when it comes to learning/personal development. It does not have to have a financial aspect to it at all. There are a wealth of opportunities for people to develop skills through volunteering, organisations like JCI etc which they can pursue. As learning facilitators we should be encouraging staff to think creatively about their learning opportunities. As an example in my early career I wanted to develop my public speaking skills so I joined an organisation (out of hours) which enabled me to do just that. If someone who wants to develop their leadership skills approaches you then why not talk to them about the opportunities in their local community or through voluntary organisations to develop those skills? Equally if someone wants to learn how to chair meetings a simple way to start is to get them to observe the chair of meetings they attend, note the positive behaviours and those that don’t necessarily deliver results and then seek opportunities to practice those skils. – I absolutely agree that personal and professional development go hand in hand. In order to be successful in the workplace, you must arrange your life to be able to devote your time and thoughts throughout the day to your work. I’m not saying to neglect the kid’s recitals and the wife’s dinner plans. I’m just saying to schedule yourself accordingly. Don’t thin yourself where you’re shooting from the hip, making rash decisions. Don’t stretch yourself so much that you aren’t outputting quality work. Just adjust. Make time. Your competitors are. Final thought: Until you’re retired, the reality is–we must work. And the worst part is that we must work ourselves into our graves. It’s the way it’s seeming since our generation most likely won’t have any savings (is that what they call it? ), let alone a pension our dads got.